Power Wheels Boomerang, like the other ride-on toys by Fisher-Price, is the exceptional gift for children. But what exactly makes them crazy about it? We’ve got a high-quality recommendation for you, coupled with all the details you need to cast light over your doubts. 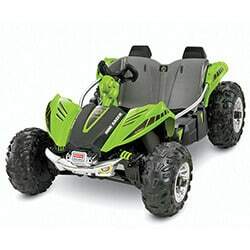 Q: How reliably can this toy ride on rugged terrain? Q: What happens if my child is older? Q: Can two children ride it? Children who love speed are bound to love the Boomerang by Fisher-Price. Several features about the toy catch the eye, but you’d do well to learn a few things of it. Tilting While Turning: Each turn is enhanced with a directional tilt, adding thrill and effectiveness into the mix! All Wheel Drive: It allows multi-level and irregular terrain drive. Tough Construction: Besides giving it a longer mileage, the Fisher-Price quality ensures a rugged vehicle that will last many seasons. Safety In Mind: Several features for safety are included, such as high sides, power-lock brakes, an adjustable seat, and a nifty seat belt. The Boomerang by Fisher-Price is easily a winner amongst other Power Wheels when it comes to the ride on experience. The gas pedal accelerates and releases quickly, and the shifter on the floor switches between two forward speeds and a reverse setting. There is a button on the steering wheel to activate the drift feature when turning. It allows the Boomerang to lean into turns to make them sharper and more dynamic. The driving experience is exciting, even though the engine isn’t all that fast or powerful, and this makes it an excellent option for those young racers who’d like some thrill without compromising safety or caution. Fisher-Price values safety just as much parents do, which is why the Boomerang has several safety additions to ensure every minute is fun and not a potential injury. Power-Lock brakes for quick braking. Adjustable seat, seat belt, and high sides to avoid falling. Maximum 5 mph speed and all-wheel drive to handle terrain with ease. It doesn’t have a configurable speed cap, but considering it runs slower than other models, it’s not a safety issue. The Boomerang has a nifty battery life indicator that does away with the guesswork and allows you to easily check how much power is left. The battery life itself might pose a problem, considering it’s lead-acid, which means you can’t partially charge it. For the best results, you should fully charge it for at least 14 hours, and no more than 30. It should be fully charged at least once per month to keep it in optimal shape. Lead-acid batteries aren’t meant to be partially charged, but 14 hours of recharge for up to 1 hour of driving might not be the best. While the toy has a battery life indicator, there’s no charge indicator, so you’ve got to manually track how long the battery has been charging. We suggest getting another 12v battery that fits to double the duration. It does require some assembly, but it should be fairly easy for most. In any case, an extra hand would make things faster. You can finish the process by placing the decals. As your child ages, the seat might need to be adjusted. Luckily, you can screw it in two different positions for shorter or taller children. The speed and overall safety additions should render some pieces of safety gear as “unnecessary,” but you can’t ever be too safe. 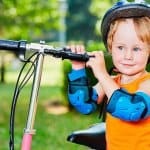 We suggest that all children use at least some sort of head protection (a helmet), and possibly knee pads as well. Despite having three wheels, the toy makes use of AWD, which means it should handle all sorts of terrains with ease, even curbs. Now, the tires aren’t made from rubber, so it might not be the best for the most extreme conditions, but it should suffice in most areas. Nothing, assuming weight is the issue. However, older children are taller, and so their legs make the operation too uncomfortable to handle. Still, as long as the child is within the weight limit, and his legs allow him to ride, he can use the Boomerang. Technically, all that matters is the weight. However, the vehicle was balanced around a single child, and so, two children riding it might lead to safety risks. We suggest you avoid this kind of usage, but if precautions are taken, there shouldn’t be a problem. Thrilling 360° spinning action to advanced riders aged 5 years and up. Zoom over multiple terrains and perform awesome power drifts and sharp turns. Monster Traction system drives on all types of terrain. While all Power Wheels riding toys do the same, each offers a different compromise. The Power Wheels Boomerang by Fisher-Price gives children all the thrill from a decently-fast vehicle, with all the safety precautions their parents need for their peace of mind. The drift and lean functions are splendid, and children love the excitement produced by sharp turns. The toy has its own share of issues, chiefly the battery life and the time it takes to charge. These issues aren’t exclusive to the toy, however, and we understand we’re asking a lot from a child’s toy. 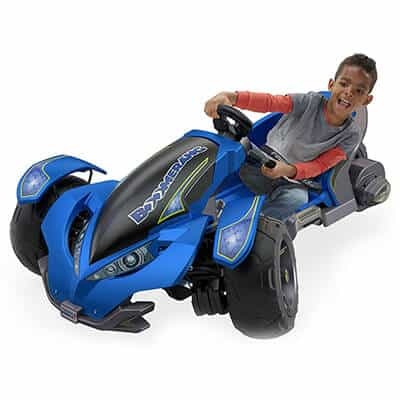 In any case, we can regard the Boomerang as a newest Power Wheels’ toy that has something in the store for just about anyone, and that is something we can appreciate. Some parents assume that Boomerang is even cooler that famous Power Wheels Wild Thing. Definitely worth a try. Whether you live out in the country or in the suburbs, the Boomerang is a decent choice and, depending on who you ask, the best. Buying gifts for kids is not simple, and finding the best one is difficult if you don’t know what your child wants. 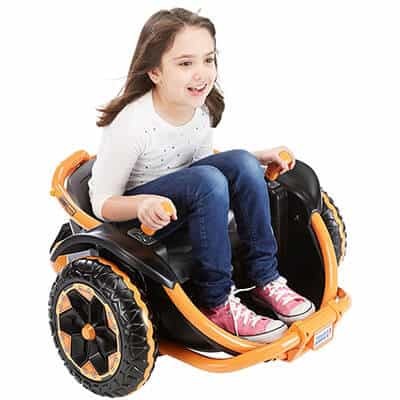 For these reasons, we believe the Power Wheels Boomerang is an excellent ride-on toy, one that children will love, and one that is worth the money.